Are you considering Bartender Training in Maryland? Reading this page will give you the information you need to make a decision on your future in the exciting world of bartending. Over the last several decades Maryland Bartending Academy has cemented its reputation as the Baltimore-Washington area's premier bartending school. Whether you need to learn how to bartend with our basics of bartending classes, or are a current bartender wanting to earn the best bartender wage, MBA can give you the training and skills necessary to maximize your bartending career potential. If you are ready to sign up for MBA or if you have any questions, please call us today at 410-787-0020 or click here to sign up for a free class! What Can You Get Out Of Bartender Training in Maryland? Bartending training in Maryland is the best way to achieve the most out of your bartender employment in Baltimore, Annapolis, Glen Burnie, or around the state; earning the top wage, and having fun at your job. How does bartender school help so much? Bartending school introduces you to the best techniques from our trained, experienced, professional bartenders. You can get the lowdown on making the best tips and some pointers on fancy trick bartending techniques. To have a complete introduction to the exciting future that could follow your bartending training in Maryland, attend a FREE INTRODUCTORY CLASS. Get first-hand information on how you fit into this exciting world. How much bartenders make? Do you want to make the average wage, or are you ready to get paid more and have better hours? We can prepare you to make the most out of your new job. What are the bartending laws in Maryland? Prepare yourself with all the important legal information that you might need to deal with on the job. Do I need a bartending license in Maryland? Make sure you are properly certified with all the documentation an employer is looking for in a new hire. How long is bartending school? How long does it take to be properly prepared for the real bartending world? Will you help me get bartending employment? MBA has the connections and proven program that will hook you up with a great Maryland bartender position, after your bartending training is complete. With our bartending certificate and job placement services, you can ensure that you will quickly find yourself in a position, having fun and leaving with cash-in-hand, every day. Ready For A Bartender Class in Maryland? To get more information on the Maryland Bartending Academy, or for answers about obtaining a bartenders license call 410.787.0020 or fill out a School information request form. Classes at our bartending school are limited in size, so make your reservation early with a $100.00 deposit to secure your seat in the class of your choice. Your deposit will be applied to your tuition fee. School registration hours are Monday through Friday, 9:30am to 6:00pm. Call the Maryland Bartending School at 410-787-0020. Discover and PayPal are accepted. at home or on the job! 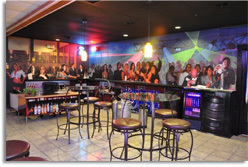 Copyright ©1999 - 2009 Bartenders Academy, Inc.